Statement sleeves are having a fashion moment. Fashion-forward ladies are doing elongated, oversized, flared, layered and bell or balloon-shaped sleeves. Statement sleeves elevate your look - even paired with simple bottoms, a statement sleeve enhances your fashion-style. AND they look great in a photo (especially hailing taxi or dancing in the street). Movement in fashion attracts attention and makes for an excellent Instagram pic. I consider myself a fashionable person, and I follow trends intently, but I do sway on the subtle side of each fashion trend. I don't wear loud colors or outrageous shapes, and if the trend is statement sleeves, I'll opt for a muted shade and simple version of the in-the-moment style. 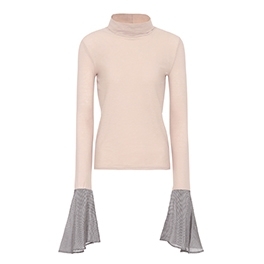 Acne Studios Cleo cotton turtleneck top (available at mytheresa.com) is light-weight, light-hued and has elongated frill cuffs that will hang out of your sweater or jacket. This style is simple with a little 'flare'. 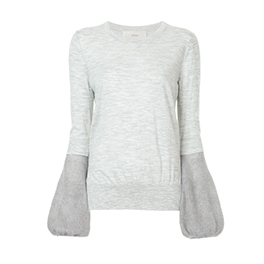 This Fendi fur-embellished cotton blend sweatshirt (available at mytheresa.com) is my favorite bell-sleeve style. Fox and mink fur in the shape of flowers give this sweatshirt a playful vibe. This Fendi sweatshirt would look great with straight bottoms, or silk joggers and heels. 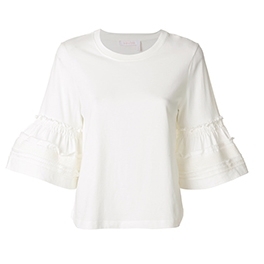 This bell-sleeve cotton top by See by Chloé (available at Farfetch) is feminine and chic. The three-quarter length sleeves are slightly flared, bell-shaped and ruched. This top would look great with flared jeans. See by Chloe clothing styles often have a romantic vibe - I love this brand. I'm a HUGE sweatpants fan - with sneakers, booties or heels, I can don joggers everyday. This bell-sleeve sweater by Cyclas pairs perfectly with fitted sweatpants and sock-like booties. The two-toned gray sweater is made of silk, mohair and wool. This sweater screams my name, BUT it's sold out everywhere (insert sad face).